This Item is a Pre-Order and will arrive on: Tuesday July 09th 2019 ! APR190565 - In this new collection, Swamp Thing is out of his element as he shepherds a lost boy through a blinding blizzard and other hazards of a strange, frozen tundra. In this touching and harrowing tale of survival, the pair must navigate countless threats throughout a bewildering terrain-with a bloodthirsty snow monster hot on their heels. But how long can they rely on each other? Plus, on Halloween, the barrier between worlds grows thin-and only the Swamp Thing is strong enough to face the monsters that come from the other side. 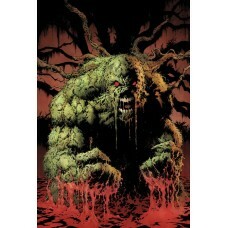 In addition, this book features the final Swamp Thing story from the monster's co-creator, Len Wein. Originally intended as the start of a new series, it is presented here with art by Kelley Jones. Collects stories from SWAMP THING WINTER SPECIAL #1, SWAMP THING HALLOWEEN HORROR GIANT #1 and stories from CURSED COMICS CAVALCADE #1 and YOUNG MONSTERS IN LOVE #1.